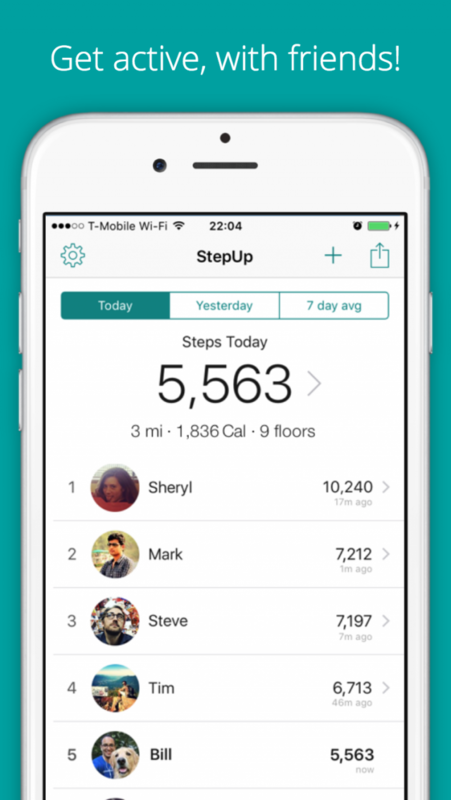 Step Up is the only pedometer app that makes step tracking social & fun! “Motivates me to exercise everyday and I’ve LOST WEIGHT already!. :)" - Tim F.
“Competing with friends is so much fun! It’s addictive!” - Diana A. “Love the simple, elegant design! It’s the best step tracker app - better than Moves, Pacer, Noom, Fitbit & Runtastic!” - Anne S.
See your steps walked, distance covered and calories burnt every day. Track your daily progress, set goals and step up to achieve them. See who’s in the lead, cheer (or taunt) each other and compete in real time! StepUp helps you & your friends be more active, healthy & awesome by starting some fun, healthy competition. StepUp uses Google Fit to track your steps as you walk with your phone in your hand, pocket or bag. No wristband or other hardware required. Works entirely from your phone with no additional setup. Google Fit tracks your activity in the background with no impact on battery. It does NOT use your location. DOWNLOAD NOW, and start stepping up to an active, healthy lifestyle with your friends!